Going into yesterday’s episode of The Walking Dead, fans were preparing themselves for a shock. 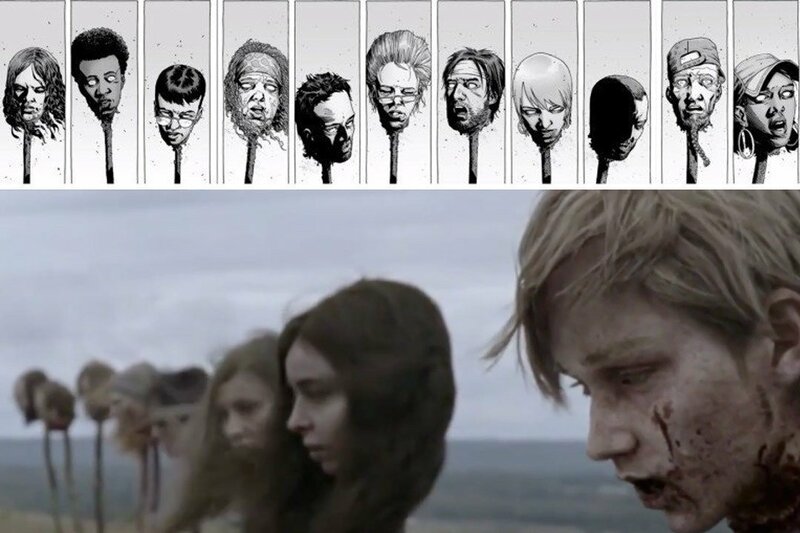 It was no secret that the penultimate installment of season 9 was to adapt a key moment from the comics that saw the Whisperers murder a number of survivors, gruesomely displaying their heads on pikes to mark their territory. The only question was: who was going to die in the TV version? Would it be mostly the same line-up? Or a completely different roll call of victims? As it turns out, the latter. In the source material, Alpha and her cronies claim 12 victims, the most notable among them being Ezekiel and Rosita, who was pregnant. Both managed to survive the Whisperers’ wrath in this episode, plus the death count went down to 10. However, three major characters met their fates instead. And they’re Henry, Tara and Enid. The others are Ozzy, DJ, Addy, Tammy, Frankie, Alec and Rodney. Also, Tammy’s the only character to die in both the comic and the show. Of course, the devastating reveal came at the end of the episode. Alpha captured Daryl, Michonne, Carol and Yumiko and warned them not to cross her or Whisperer territory. As proof of her threat, she sent them to inspect the Northern border of her land – which is where they found the horrific site waiting for them. All four were heartbroken, with Daryl attempting to shield Carol of the sight of what Alpha had done to her son. Showrunner Angela Kang has explained that this event nearly marked the end of the season, but it was decided that the finale was better served as an exploration of the aftermath of what the Whisperers had done. Plus, the conclusion of season 9 will see the survivors facing a biting blizzard for the first time on the show. Be sure to catch it when The Walking Dead finishes its current run this Sunday, March 31st on AMC.